Have you ever spent a good bit of effort on setting a special table, only to realize it didn’t really go with the decor in the room? I used to avoid certain color palettes because the colors that I had in the background wouldn’t sit well with the colors on the table. 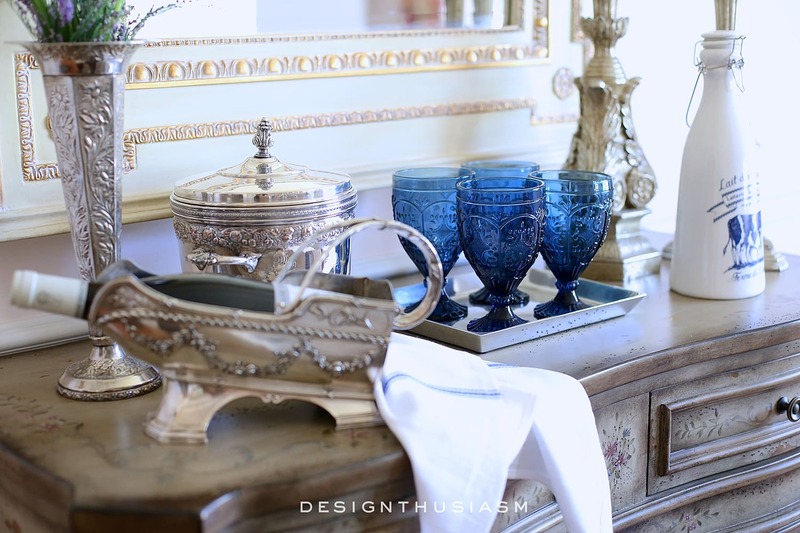 But I’ve really been “feeling blue” for an upcoming tablescape and decided the quickest way to merge it with my decor was to style a blue vignette on the sideboard. 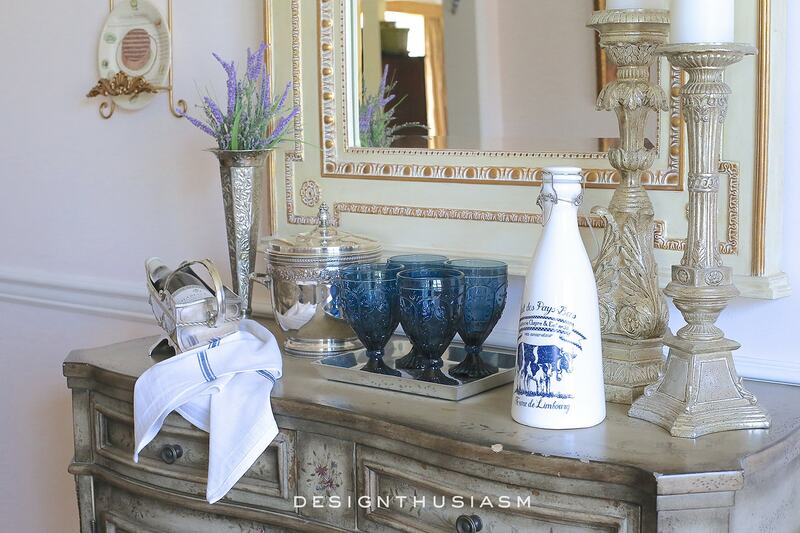 The tablescape has a rustic French feel, so I kept the sideboard in the same vein. 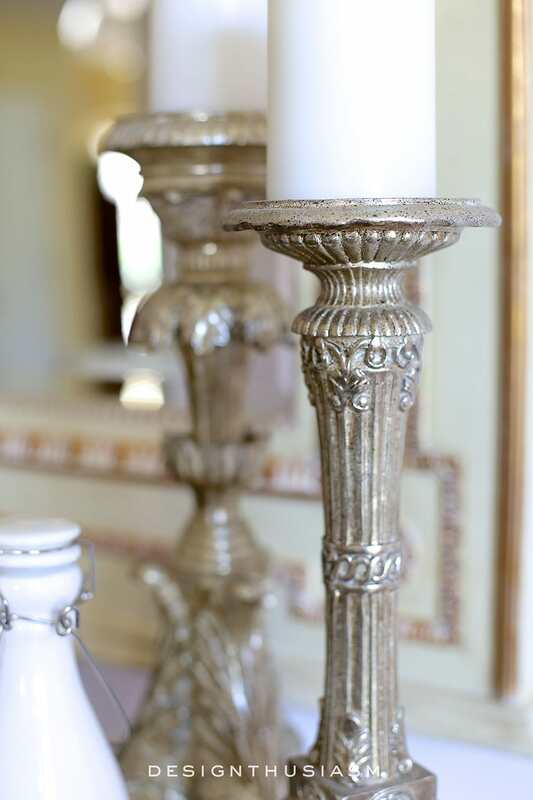 The statuesque candle holders are silver toned with chunky white pillars topping them. 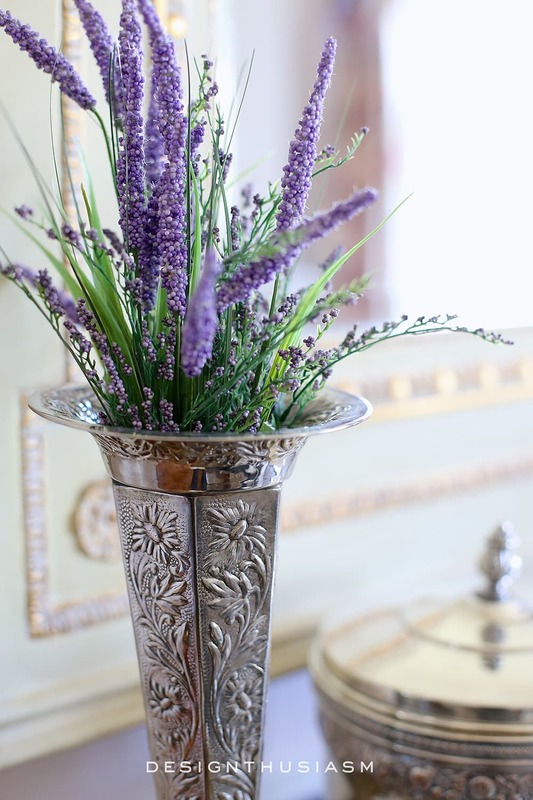 A tall slim repousse silver vase has a fluted lip that looks lovely spilling forth lavender blooms. 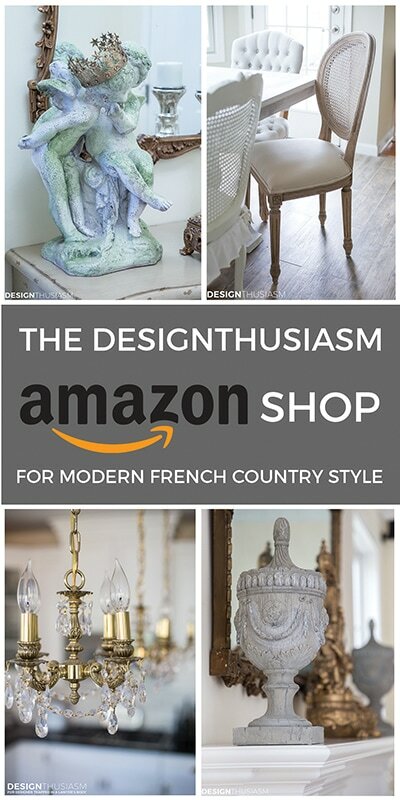 Much like on the table, I like to mix rustic country elements with heirloom silver pieces. The cotton tea towel has a herringbone weave and is accented with French blue striping. 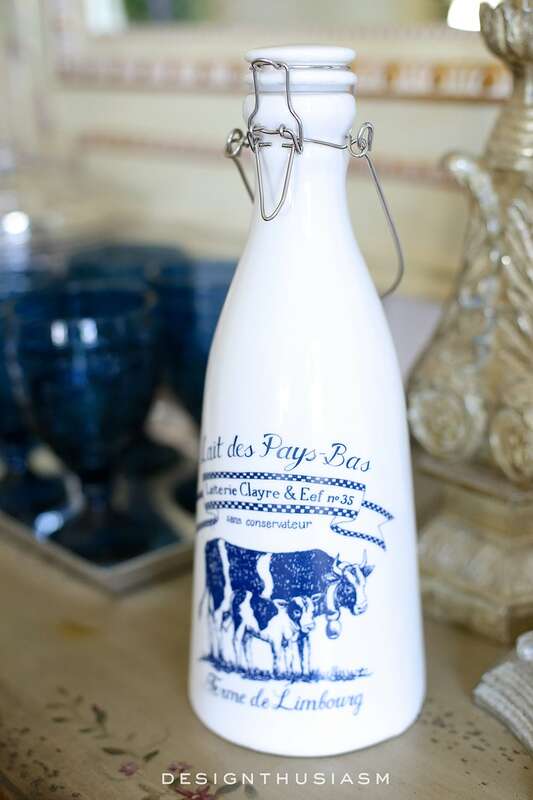 The little French milk bottle was a recent find and complements the mood in the room. 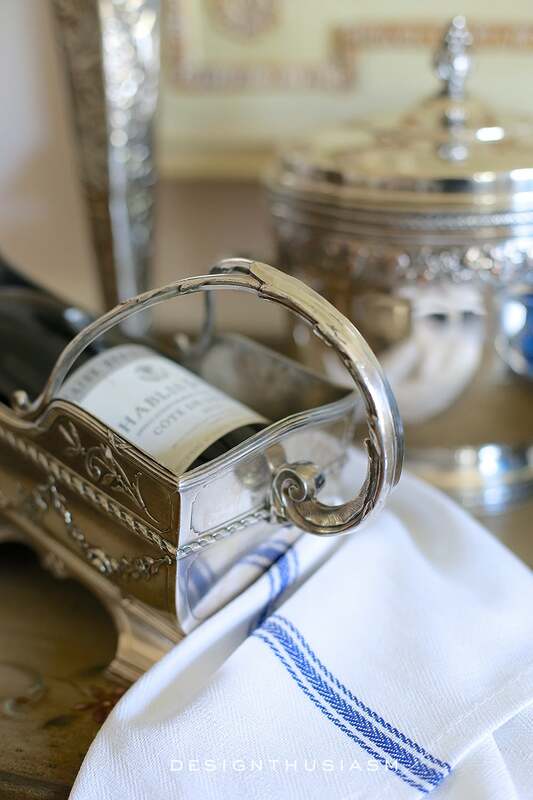 One of the more formal pieces, this silver wine caddy was picked up at a street market in Villefranche sur Mer, in the South of France. 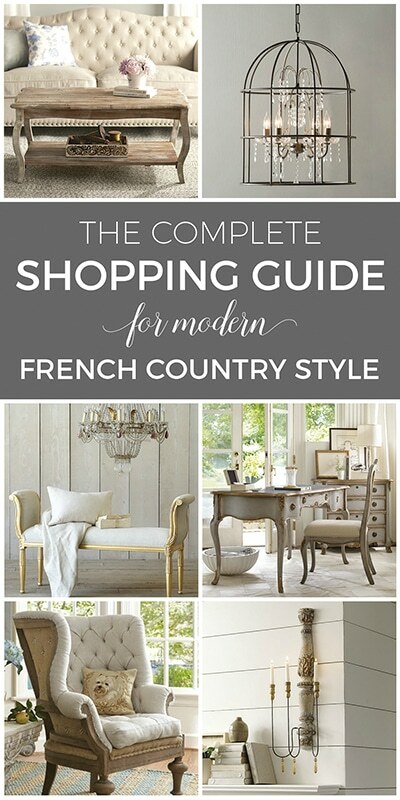 A white tea towel picks up the French blue accent with a decorative striping. 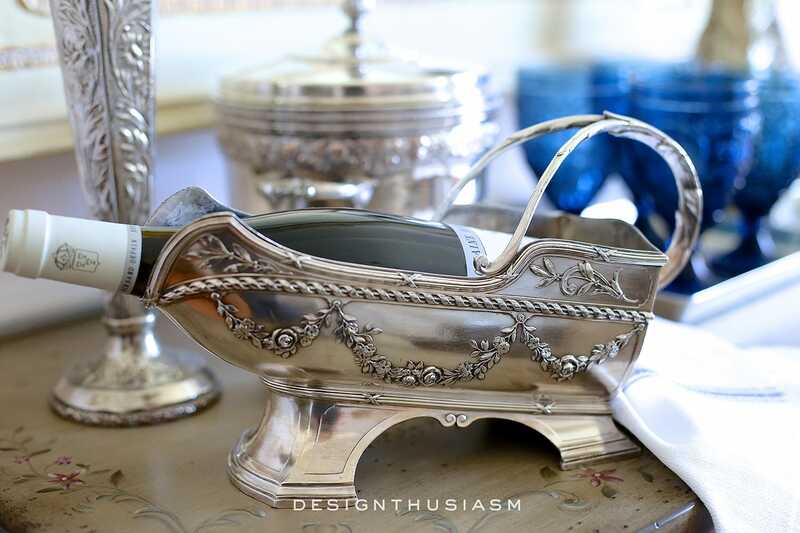 In the background is another vintage favorite, a silver wine bucket with repousse trim. 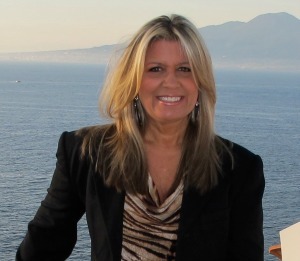 Thanks so much, Vicki! I hope to have the tablescape up by the morning… 🙂 Stay tuned!! 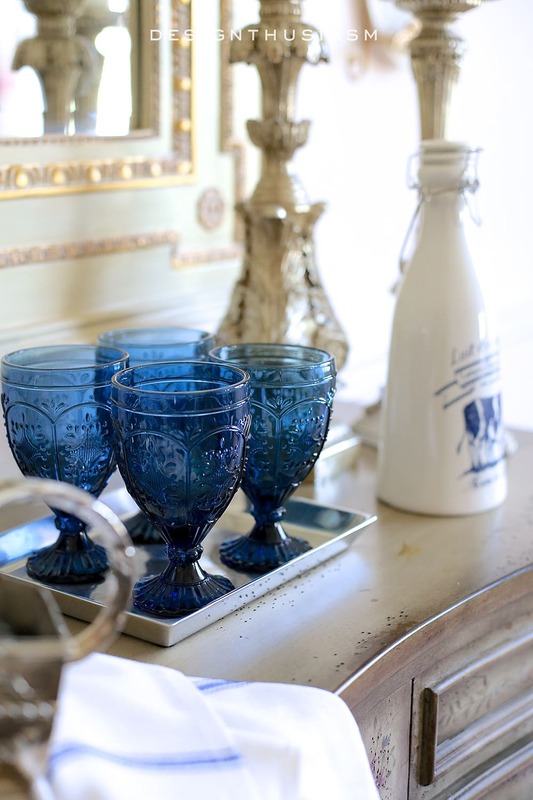 I love those blue goblets – the color is so rich and inviting! 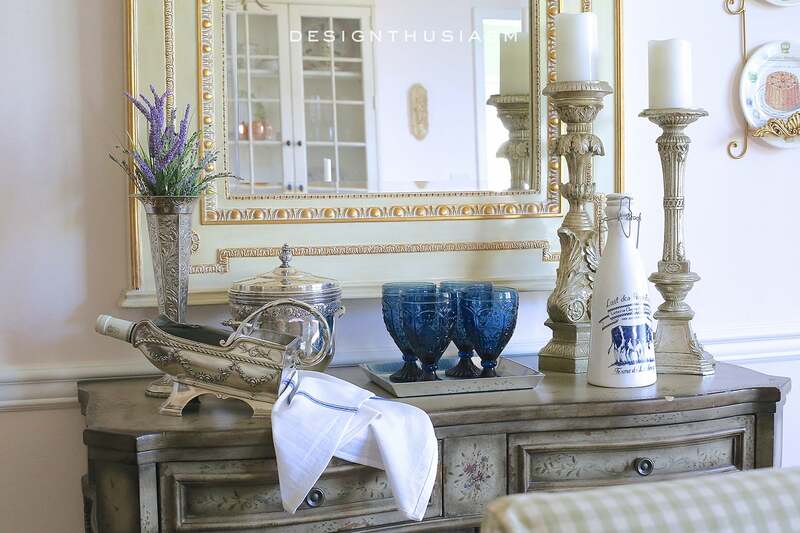 I am such a fan of mixing rustic and refined and you do is so beautifully (and what appears to be effortlessly). 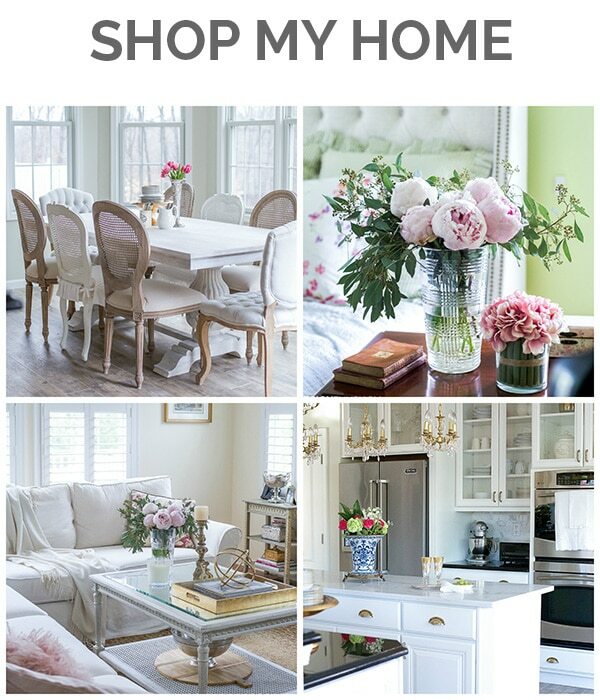 I am so thrilled to have found your blog and look forward to seeing what you are doing next! Wow, thanks, Valerie! It’s a pleasure to have people reading along who appreciate the same things I do… 🙂 I’m delighted you found me too!! 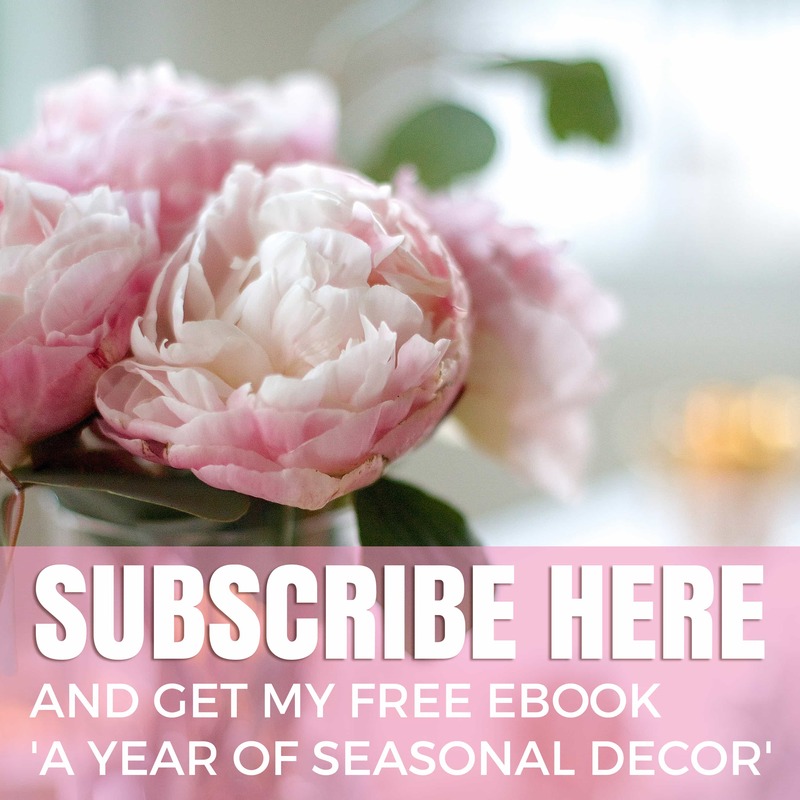 Love that you have so many varied and lovely ideas running around in your head–makes me use mine lol! 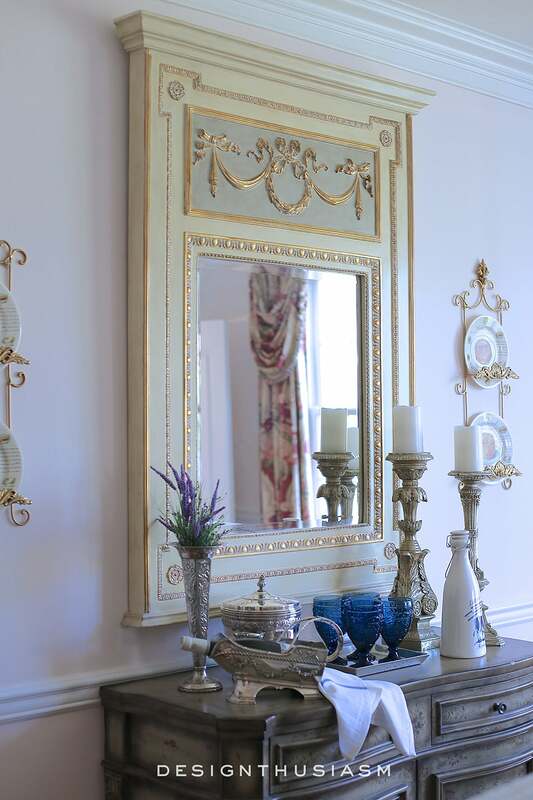 That mirror is exquisite! And really you ticked all my boxes: gold, silver, blue….. dreamy! Everything is elegant! Blue glasses, great pop of color!